The more you know about your customers, the more you can provide to them information that is increasingly useful, relevant and persuasive. You may have to but once you have it you’ll have the Mother Lode of customer engagement capabilities. That was the thesis of a recent Webinar I conducted with my friend and collaborator Jamie Beckland from Janrain, an organization that helps companies improve their conversion rates, relevancy and customer satisfaction by gathering and managing social media profile and behavior data. They are perhaps best known as a provider of social sign-in, whereby you can register or sign-up just by clicking Facebook or Google or Twitter or Linkedin logos, and providing permission. But, they do a lot more than that, and they do it for some of the biggest companies in the world. Plus, Janrain is a long-time partner and sponsor of Convince & Convert and the Social Pros podcast (thanks!). Eureka! 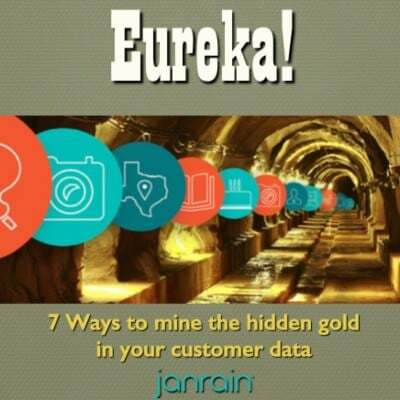 7 Ways to Mine the Hidden Gold in your Customer Data from Janrain on Vimeo. This is the key to data mining, and why it is so critical. Data equals relevance, and relevance equals success. Best represented by the Interscope Records case study, this full-blown data mining allows for true 1:1 engagement opportunities across multiple websites, mobile apps, email programs, etc. Interscope Records saw a 900% increase in email open rate using this collection of tactics. This is when you carefully gather data from your customers and prospects directly, and use that data to boost relevance (and results). Software company Avalara used this technique to customize their Webinar topics and follow-up, and produced a 303% increase in Webinar attendance. This is where you use contests, customer assignments, points, badges, levels and more to encourage data exchange. Slim’s Pickins records used this solution and ended up getting their contest hashtag trending worldwide on Twitter world-wide. In this data-mining option, you use the click behavior on your website and in your emails to produce highly targeted, automated email sequences. This is also known as “progressive profiling” and “drip marketing.” Paper goods e-commerce provider Paperstyle used this playbook to increase their revenue per email by 330%. Here, you use customer segments created based on historically website behavior and use these profiles to rifle-target advertising (for websites that sell ads). New Zealand Herald newspaper online grew their revenue per impression by 20% by using this approach. This is when you track people who have visited your website(s), and then only show ads to those people downstream. We use this tactic consistently here at Convince & Convert, which led my mother to ask me why we were advertising on a knitting website. This is data mining for individual or small business use, rather than corporate. The best examples of this are plug-ins like Rapportive, which show you the social media status of people in your Gmail contacts, or Email Tracking by Hubspot (which I love) that tells you when someone has opened or clicked on an email you sent them. Watch my Webinar with Janrain for many more ideas and examples about how to use data mining to improve your marketing.